Prototyping is a fundamentally collaborative activity. 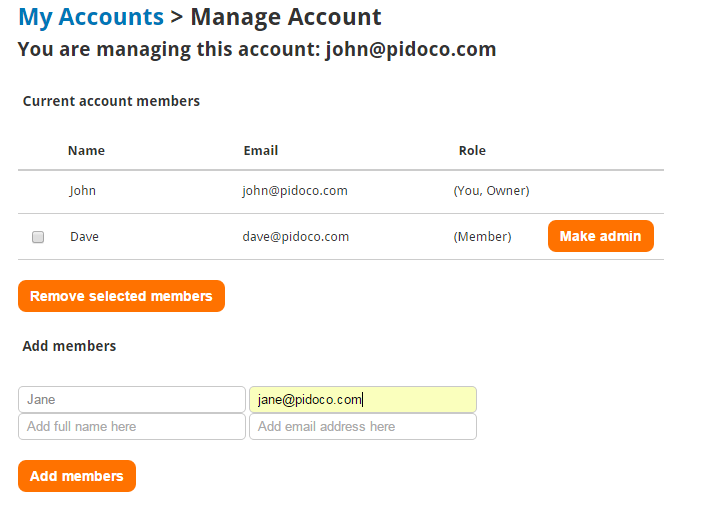 That’s why Pidoco allows you to add multiple users to your account. These account members can have different roles in order to facilitate project organization. For instance, a project manager may purchase a plan and appoint the UX lead as admin, who in turn can manage account membership for her/his entire team. In this post, you’ll learn how to manage account membership. Members can create and share prototypes. Admins can also add members to the account and remove them. The Owner has full power: In addition to everything an admin can do, she can purchase plans, change the account’s name and appoint new admins (or demote them). To find out which role you currently have, log in to your account, click on your email address in the top right corner and select My Accounts. The entry “You are:” will tell you your role in any given account. Note that you may belong to several accounts. If you are the owner or an admin, you can add other users to the account. To do so, just click on “Member Administration“. Now you can add new users in the Add members section. Simply enter the user’s name and email address and confirm by clicking the “Add members” button. New users always start out as normal “Members” of the account. You can assign them a different role later. Hint: You can add multiple users at once. Adding a user to your account does not mean that the user will automatically have access to all prototypes in the account. Instead, all prototypes are private to the user who creates them until s/he chooses to share a prototype. To remove a user from the account, select the user in the Current account members section and click the “Remove selected members” button. 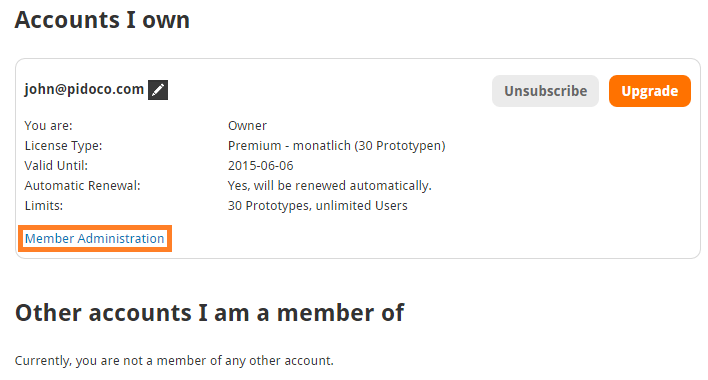 Note: All prototypes created by any account member count toward the account’s prototype limit. You can make a normal account member an admin or demote admins to normal account members. To assign a role to a user, click on the use the buttons “Make admin” or “Make member” in the Current account members section. That’s it! You have successfully added new users to your account! 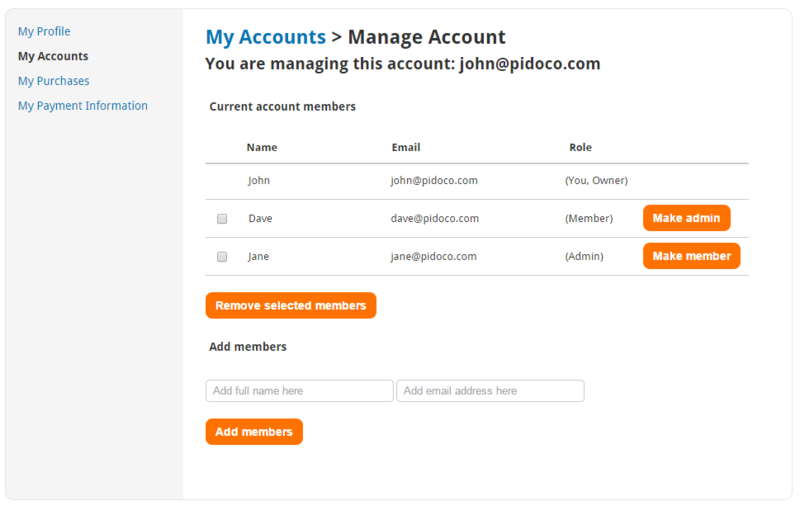 Do you need help managing your account members? Then do not hesitate and drop us a line via support@pidoco.com or Facebook and Twitter.